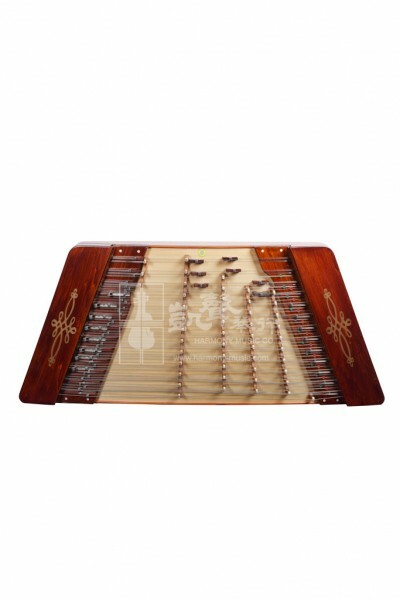 Crafted for Professional Performances, this Yuehua 402 Yangqin with its Chinese knot pattern (拉絲銅) is another classic design by Yuehua, one of the most experienced and established Yangqin manufacturers in the capital of China. A pioneer model in using CNC technology ensures precise Yangqin parameters and greatly improves sound quality. The body of the Yangqin is made of Selected Premium Woods in the Northeastern regions while the sound board is made of Selected Paulownia in Henan. The sound posts are made of Selected Pine Woods. This material combination produces bright, clear and elegant tonal colors.